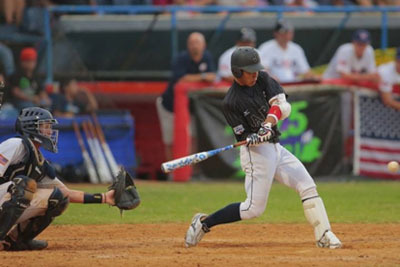 MAZATLAN, Mexico - Facing its first real challenge of the 2014 WBSC 'AA' World Cup, the USA Baseball 15U squad (4-0) was more than up to the challenge as it took down previously unbeaten Japan (3-1), 7-2, at Estadio Teodoro Mariscal in front of an estimated 3,800 fans. With the win, Team USA clinches group B as it boasts wins over 3-1 squads Panama and the previously mentioned Japan. "All week we have talked about being one heartbeat and we have been getting closer to that point, but tonight it was a total team win," said manager Chan Brown. We had a lot of good things tonight like sac bunts, great pitching and key hits. We need to get better on defense as we had a few errors that we need to knock out of our system, but overall it was a total team win. It was the first real test and the guys responded." Facing its first deficit of the tournament after Japan plated one run in the top of the first, the U.S. went to work over the next three innings as it brought five runs across the plate. In the first, a wild pitch from Japan pitcher Katsuhiro Kobayashi scored Brice Turang (Corona, Calif.) from third to tie the game at one. One inning later, Steven Williams (Albany, Ga.) hit a rocket solo homer on a 1-0 pitch over the right-field fence to up the lead to 2-1. A couple of plays later, an error by first baseman Taiki Kato allowed Noah Campbell (Durham, N.C.) to dash home from third to make the score 3-1. In the third, Alejandro Toral (Davie, Fla.) rewarded Blake Paugh (Scottsdale, Ariz.) for his double down the left-field line with a single up the middle to make the score 4-1. Later in the frame, Toral scored from third base on a wild pitch to give the U.S. a three-run cushion. Japan trimmed into the lead a bit in the seventh as Hisashige Iwamoto scored on a wild pitch after getting on base with a double and advancing to third on a wild pitch. A double and a walk put runners on first and second but pitcher Doug Nikhazy (Ocoee, Fla.) stepped up big with a strikeout of Nobuya Ohsone to end the threat. An inning later, Team USA scored the final runs of the game as a pair of Japanese miscues led to Paugh and Toral crossing the plate to make the score 7-2. Solid U.S. pitching throughout the night held a powerful offense unit under control all night as Japan only plated two runs after averaging 12.7 runs (38 runs total) in its first three games. Lefty Hugh Fisher (Eads, Tenn.) started and went six innings, allowing one run on three hits and two walks while striking out four. Nikhazy went 1.1 innings before righty John Dearth (West Covina, Calif.) entered and blew pitch after pitch past the Japanese batters, routinely touching 88-91. He went 1.2 innings and gave up one hit while striking out two.